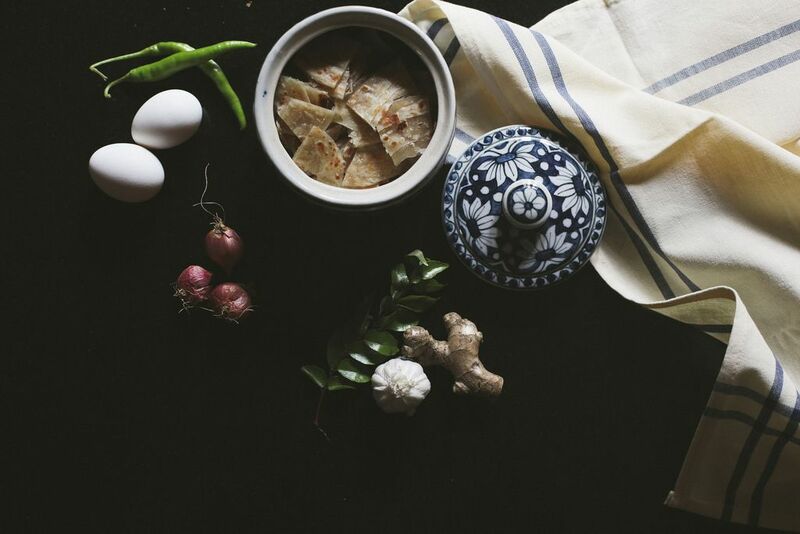 Today: Aysha of The Malabar Tea Room shows us how to make one-pot kothu paratha, a dish for nights when it rains and pours. It’s been raining where I live in Kerala, India for the past week—not the polite pitter-patter that usually comes right before summer's monsoon season, but torrential rainfalls where the skies open up and it feels like nature is having an emotional outburst—lightening and pyrotechnical effects on full display. The effect has been immediate: The pace of life has slowed down (even more than usual) and people are gravitating to their verandas to watch the rain, newspaper and chai in hand. As for me, I've been heading indoors to feed my craving for this one-pot meal. 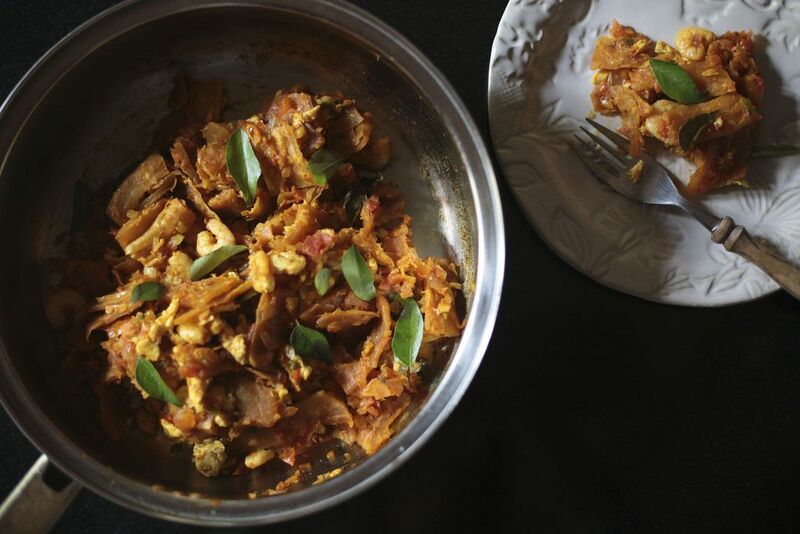 Lately, my mother and I have been making a lot of kothu paratha, a street food common in certain parts of South India. 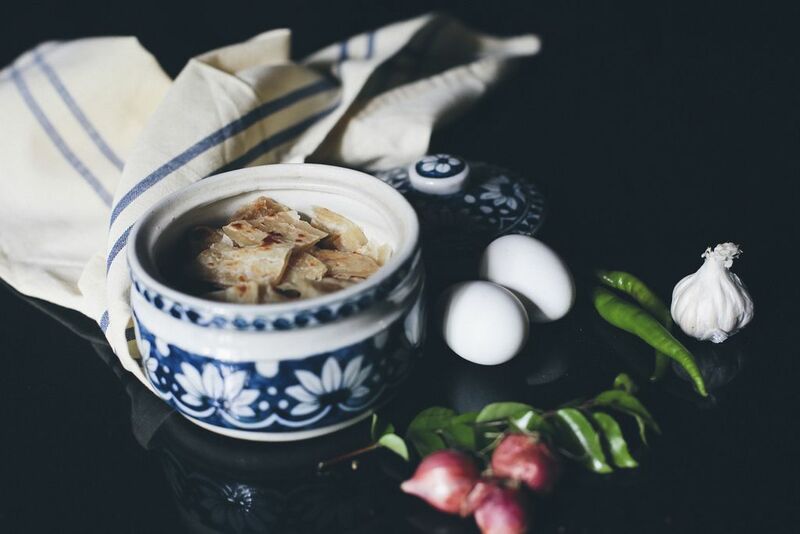 Although the dish has origins in Sri Lanka, kothu paratha has been wholeheartedly embraced here in India. If you've watched a halal vendor in New York City fold the pita bread into the chopped meat, hot sauce, and "white sauce," sautéing it until all the flavors amalgamate and char deliciously in certain spots, you know what it’s like to watch kothu paratha being made in India. Parathas, flaky wheat breads that are popular in the subcontinent, are chopped into bite-size pieces, sautéed with meat and vegetables, and doused in a spicy masala. And if that weren't good enough, lightly scrambled eggs stirred throughout the dish take it to a whole new level of deliciousness. More: Can't get enough? Here's a breakfast dish that uses the same principle—anything thin and starchy with eggs is delicious. Although it is traditional to make your own parathas, the ready-made parathas available at Indian grocery stores will work just as nicely. It also is worth mentioning that even if you have to go out of your way to obtain curry leaves, do it. 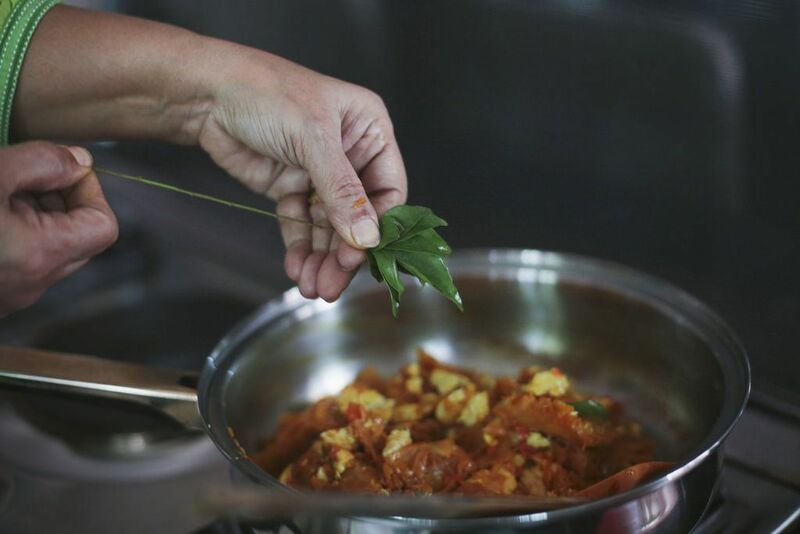 Curry leaves are to South Indian cooking what butter is to pastry. Chop the parathas into bite-sized pieces (roughly 1 1/2 inches wide), then set them aside. Grind the ginger, garlic, chiles, and shallots with a mortar and pestle to a coarse paste. Heat 1 tablespoon of the oil in a large pan. Add the eggs and scramble them gently, removing them from the heat before they get too dry. Transfer the eggs to a plate, then heat the remaining 2 tablespoons of oil in the pan, add the chopped onions, and sauté them until they're soft and translucent. Add the coarsely ground ingredients and add them to pan of onions. Sauté them over low heat until fragrant, about 2 to 3 minutes. Add the tomatoes, chili powder, garam masala powder, pepper, and turmeric. Sauté the mixture for another minute. Now, add the shrimp and curry leaves. Raise the heat to medium and let them cook, covered, for 3 to 4 minutes, until fragrant. Remove the lid and sauté the mixture until the shrimp are cooked through, about 2 minutes. You'll also want to make sure that the shrimp mixture has dried out, as that will prevent the parathas from turning soggy. Working quickly, add in the chopped parathas and gently mix them until well-coated. Lastly, add the eggs and give the mixture one final stir. Serve hot—preferably on a rainy day. An Indian food-writer with a penchant for cookbooks with obscure ingredients, Aysha spends most of her time adapting recipes from the world over in her small-town south-Indian kitchen with her mother, and recording the successful experiments at www.malabartearoom.com. When not tinkering about in the kitchen, she can be found reading up on possible Game of Thrones theories that will bring back Jon Snow. What would you recommend substituting for shrimp to make a vegetarian version?? would this work with pieces of chicken too? yes it would, katie. In fact, chicken is more commonly used than shrimp, I just happen to prefer it with shrimp:). 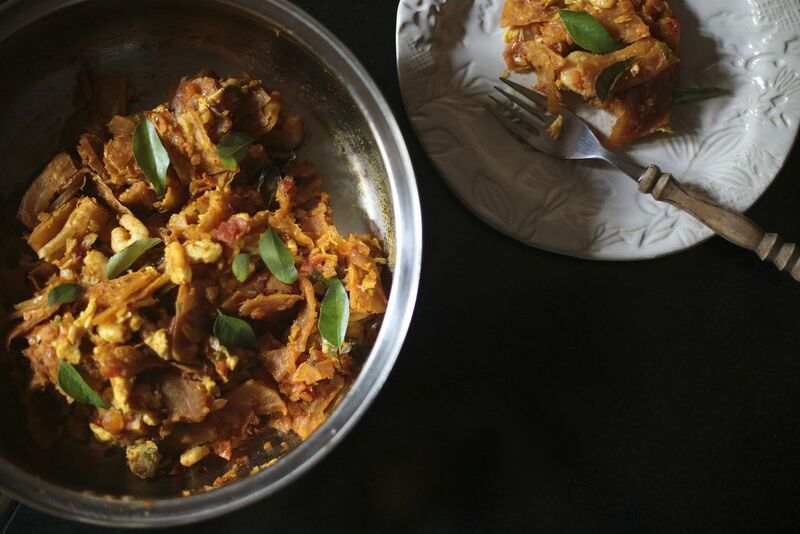 Kothu paratha is a great way to use up pretty much any left over meat you have in your fridge! Please back me up on this (because I know I'm correct): chai tea is always redundant, always the wrong name for chai, right? I'm always argued with abo it this. Even Starbucks calls it chai tea! Chai is the Hindi word for Tea(The leaves and the beverage.) In India, you would just order "chai" and they will usually bring you a delicious, hot, beverage of black rolled tea leaves, that have been boiled in milk and water. The addition of spices like cardamom, cloves, ginger etc makes it "masala chai." So yes, calling it "Chai Tea" is redundunt. But, in the west, I assume that companies started naming their tea products that had these spices in them "chai tea," to specify that the type of tea(the beverage) will have spice notes in it. Whatever you call it though, the stuff is addicting! I wince everytime I hear someone say chai tea!!! But that said, i loved the chai at starbucks, even if I felt silly saying chai tea!